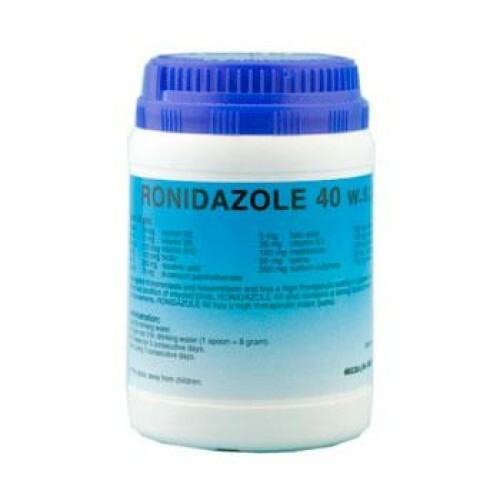 Ronidazole 40 by Pantex is active against trichomoniasis and hexamitiasis & has a high therapeutic activity in pigeons infected by these protozoa. To improve bad condition of infected birds, RONIDAZOLE also contains a strong dose of vitamins, amino acids & trace elements. • For prevention during the racing season: every 3 weeks, for 3 consecutive days. • As treatment for large cagebirds in common: 2 measuringspoons (=2 gr) for 20 pigeons or 1 measuringspoons (=1 gr) for 5000 g live- weight during 5-7 succesive days. • As Therapy: administer during 7 consecutive days.